The LC4 was designed in 1928 and brought to the lime light one year later, at the Salon d'Automne in Paris. It comes from the furniture collection, which was a product of the collaboration between Le Corbusier, Charlotte Perriand and Le Corbusier’s cousin, Pierre Jeanneret. In 1928, Le Corbusier, who so far had been mostly known as the modernistic architect and urban planner, under the influence of Perriand, began his involvement with furniture design. While working on the furniture line, Le Corbusier successfully applied his architectural philosophy of placing mankind’s needs at the center of his designs. As the result, the LC4 Chaise Longue is perfectly tailored to the ideas of rest and relaxation. While looking at the soft, body-shaped curves of the LC4, it becomes clear why it is nicknamed the “relaxation machine”. However, it not only caters to one’s physiological needs, but it also appeals to the most sublime tastes of any aesthete. The LC4 Chaise Longue is undoubtedly one of the symbols of 20th century modernism. Even today, almost nine decades after its presentation, the LC4 has neither aged nor become trite. It still looks fresh, extravagant and contemporary. The Chaise Longue consists of two main components: a lower, stationary base and an upper, movable frame. The base is made of welded, enameled steel panels. It is black, with a mat surface finish. Its upper portion is supported on two, semicircular pipes. This allows its user to freely adjust the chair’s inclination angle; from upright to full recline. The adjustable frame is made of bent, chrome-coated, steel pipes whose shape is meant to fit the curves of the human body. Numerous elastic straps, spanned between the pipes, provide support for the thin mattress buckled to the frame. The bolster, also clasped to the frame, serves as a headrest. The mattress is manufactured either from cowhide, pony leather or beige canvas. While the cowhide and pony leather mattress comes with a black leather bolster, a canvas alternative is available with either a black, amber or dark brown leather bolster. Today, the chair is manufactured in Italy by Cassina, which holds an exclusive worldwide license from the Le Corbusier Foundation. It has been in production since 1965. The overall appearance of the Chaise Longue is extraordinarily appealing and stylish, which should come as no surprise since it is one of the items on display at the Museum of Modern Arts. This piece of furniture is a perfect combination of an astonishing form and exceptional functionality. It is particularly well depicted in Perriand’s memoir where she wrote: "While our chair designs were directly related to the position of the human body… they were also determined by the requirements of architecture, setting, and prestige”. Charlotte Perriand first applield for a job at Le Corbusier’s studio in 1927 but she got initially rejected. She reportedly received a reply that said: “We don’t embroider cushions here”. However, her work, displayed at the Salon d'Automne, got noticed by Le Corbusier’s cousin, Pierre Jeanneret, who convinced the architect to offer her a position of the interior designer at his studio. 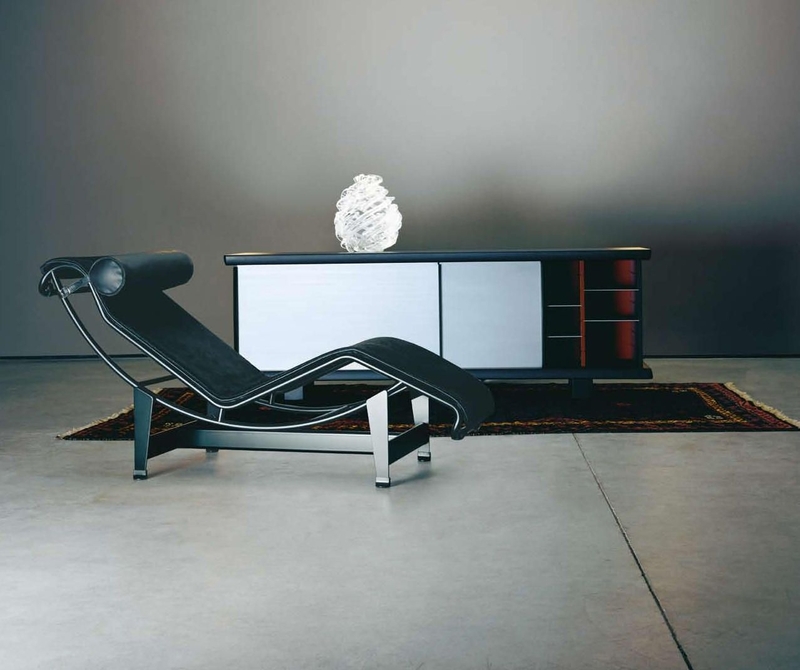 The LC4 Chaise Lounge was initially created for a villa in the Ville d’Avray. During the chair’s presentation, Charlotte Perriand posed for the famous publicity shots, lounging on the LC4 in what was then considered a “daringly” short skirt and a necklace made from ball bearings. Those pictures undoubtedly helped the Chaise Lounge to gain more publicity and attention. “La Chaise Longue” comes from French and literally translates to “a long chair”. This type of chairs originated from the Ancient Egypt.